Spaniards have a love affair with seafood. Considering Spain is surrounded on three sides by water—the Atlantic Ocean to the west, the Cantabric Sea to the north, and the Mediterranean Sea to the east—it's no wonder the Spanish crave and cook with fresh fish and shellfish of all kinds. This list includes common Spanish seafood you would find on a menu or in a typical Spanish household. The Bogavante is what we tend to think of lobster in the USA. It is a large crustacean with large claws that are full of tender meat. The spiny lobster—a seabed crustacean without claws—is called langosta in Spain and has very tasty meat. Langosta may be boiled and served with sauce, or mixed in a seafood rice dish. The langoustine or cigala is also called the Norway Lobster or Dublin Bay Prawn. It is a crustacean, but much smaller than its cousin the lobster and of the deep sea variety. Cigalas are slim and orange-pink in color, growing up to 9 to 10 inches (24 cm) in length. They are found in the Atlantic Ocean, as well as the North Sea, but are not common in the Mediterranean. They are very versatile and are often prepared by boiling, cooking on a flat grill, or frying. The centollo is a crab that is popular in the North of Spain and has long thin legs and two spines on the front for protection. These crabs can sometimes weigh in at over 8 lbs. These can be used in all sorts of Spanish dishes—soufflés, croquetas, crab cakes or empanada filling. This tasty little crab never gets much bigger than 4 inches long, is hard to crack open and has little meat. It has a blue hue and seems to be covered in velvet. It is popular in Galicia and is often simply boiled in seawater with a bay leaf. This type of crab is similar to those seen in the U.S.: large with two large, meaty claws. It can range from about 4 inches to 10 inches in length and can weigh more than 6 pounds. It has a smooth, oval shell and can be prepared by boiling and serving with sauces, in salads or other dishes. The liver is considered especially tasty. Shrimp has many names in Spanish and comes in many different sizes. Langostinos are the largest of the shrimp listed here. They are typically boiled and served cold with salsa rosa or in a vinaigrette sauce. Gambas are medium-size shrimp that are most commonly grilled with salt and lemon juice. 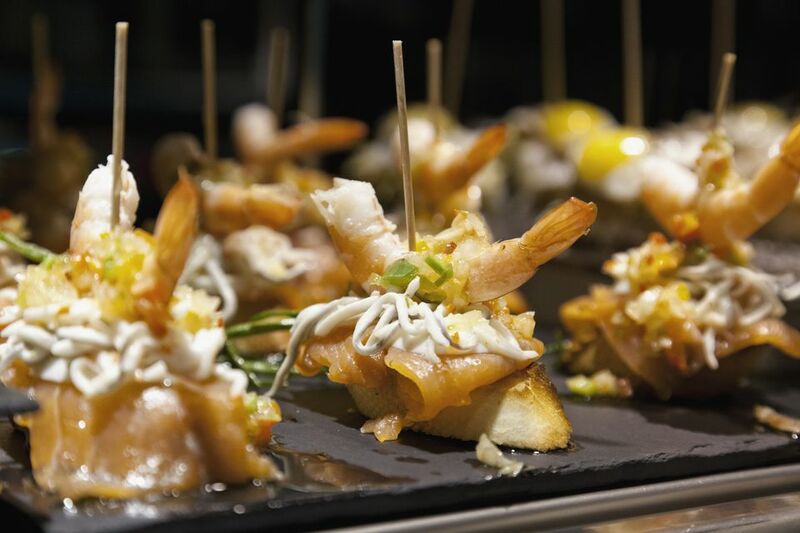 Gambas al ajillo is a popular tapas dish, made by throwing the shrimp into a hot frying pan of olive oil, adding tons of garlic and a dash of paprika and lemon juice, and served with bread. Camarones are smaller, harder to find and more expensive. Octopus has eight tentacles and is very tough unless cooked properly. Prepared a feira, the octopus must be pounded well to make it tender. Then it is cooked whole and cut into pieces and seasoned with olive oil, paprika, and salt. Calamar is typically cut into rings, breaded and fried as a tapa, and served with lemon juice. Calamar also can be cooked in their own ink or stuffed with fillings. Yes, percebes are barnacles! They look like gooseneck clams and Spaniards love to eat them. They're usually boiled for 5 minutes in salted water and served hot. As in the U.S. and other countries, oysters are consumed raw in Spain. They need little more than a squirt of lemon juice or a touch of spicy sauce but they also can be cooked with wine and garlic or breaded and fried. Razor clams look like long tubes with a shell on them. They are slightly sweet in taste and are usually broiled or steamed and served simply with lemon juice. In Spain, you will find many varieties of clam, each with their own name. Clams are popular by themselves or used as an ingredient in soups, stews or rice dishes. Mussels are also popular in Spain and can be prepared in a variety of ways: boiled and sautéed with wine and garlic, cooked with tomato sauce, added to rice dishes, in a vinaigrette sauce, or stuffed, breaded and fried, like tigres. The meat of these tiny and delicious clams is often added to soups and rice dishes to give them more flavor, or chopped finely and used in fillings—however, many Spaniards like to eat them raw with a bit of lemon juice. A common appetizer in Spain is canned berberechos on a plate with oil and vinegar.